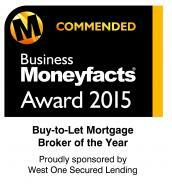 "Buy To Let Mortgage Broker the Year" 2015 Award category! The Business Moneyfacts Awards are presented at the single most important awards ceremony in the business and commercial finance calendar. Business Moneyfacts is the only industry publication to reward outstanding service levels as well as recognising product quality. Rigorous product monitoring is carried out throughout the preceding year and the community is also consulted for their feedback. Every year the Business Moneyfacts Awards showcase a sector that continues to innovate, grow and excel. The awards are a well established highlight of the industry calendar. The Business Moneyfacts Awards 2015 ceremony celebrates the 15th year of these awards. The ceremony is the pinnacle of the year's product and service advocacy and grows in stature year on year. And this year .... H D Consultants has been selected and shortlisted as a Finalist (one of only eight BTL mortgage companies to get this far in this prestigious awards ceremony in the UK), as a contender WINS A COMMENDATION for the Buy To Let Mortgage Broker of the Year. 19TH MARCH UPDATE - PROUD PODIUM WINNERS!!!!! H D CONSULTANTS NAMED AS "COMMENDED" BUY TO LET MORTGAGE BROKER OF THE YEAR 2015!! (Source) "The Business Moneyfacts Awards showcase the best that the business banking sector has to offer, and the finalists for the 2015 ceremony have just been announced. The winners are chosen based on a combination of technical merit, broker feedback and in-depth analysis from our research team, so that the awards will go to those who truly excel in their field. The awards logo is a frequently used badge of excellence in both the intermediary and direct markets". Thank you to all for your votes! We are humbled by being named as a shortlisted Finalist and we are very grateful to you for your testimonials and votes. "Having been singled out earlier this year as the winner of the PTFS' Buy To Let Mortgage Firm of the Year award, we knew that we couldn't rest on our laurels and that we had to continue to grow our proposition to meet the increasing demand of new Clients and the massive spike in new business enquiries for mortgages and loans which we have been instructed to advise on. To have been notified that we are selected as just one of eight BTL Broker Firms in the UK as a shortlisted Finalist in the Business Moneyfacts Awards 2015, is another very proud moment in our Company's history. We are by far the smallest Firm named in that category, however quantity isn't everything and we hope our quality shines through." first published December 5th 2014, updated March 2015 upon announcement of our WIN! !